18.04.2017, Strasbourg - Georgian First Deputy Foreign Minister David Zalkaliani is on his working visit in Strasbourg. On 18 April 2017, David Zalkaliani held a meeting with the EU Permanent Representatives to the Council of Europe. The focus of the meeting was, among other issues, on the situation in Georgia’s occupied regions. The Georgian side expressed its concern over the difficult security and human rights situation in Georgia’s occupied territories, the militarization of the occupied Abkhazia and Tskhinvali regions, closure of so-called crossing points along the occupation line and violation of other fundamental rights of the local population. The sides appraised as provocations the so-called “elections” held in the occupied territories, a referendum on renaming the Tskhinvali region as the Republic of South Ossetia and the Russian foreign minister’s visit to the occupied region of Abkhazia. 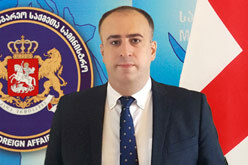 David Zalkaliani emphasized the importance of the international community’s active involvement in peaceful resolution of the Russia-Georgia conflict, as well as in ensuring that Russia complies with its international commitments. The importance of preparing the CoE’s annual report on the situation in Georgia’s occupied regons was also highlighted in this context, The First Deputy Foreign Minister also spoke about Georgia’s European integration process. The Permanent Representatives congratulated Georgia on the launch of visa-free travel with the EU. Discussions alos focused on the progress of the Geneval International Discussions and the European Union’s role in ensuring security and peaceful resolution of the conflict. Representatives of the EU Member States reaffirmed their full support for Georgia’s sovereignty and territorial integrity.